When Pablo Ziegler walked onstage toward his piano, there was the sound of enthusiastic applause from the audience. Claudio Ragazzi quickly picked up his red electric guitar, while Pedro Giraudo stepped in beside his bass. Hector Del Curto sat down with the bandoneon on his lap. Then the quartet quickly began to make music and the theatre was soon filled with a melodic, Old World sound of Tango Meets Jazz. The first tune “Once Again Milonga” was written by Ziegler. 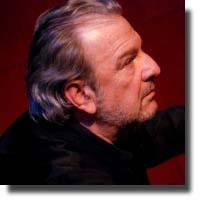 He is renown as both a pianist and Nuevo Tango composer. This was followed by another Ziegler tune, “La Fundicion” (the foundry). This piece was more mysterious, dramatic, and made me think of old detective movies. The group moved on to “Alrededor del Choclo,” which featured a bright piano sound and soulful guitar. Ziegler stopped to introduce his quartet members before saying that he was happy to be back in Vancouver, since his last visit here was in 1988. Regina Carter then walked onstage with her violin, creating an excited murmur from the audience. Carter joined the quartet to play “Michelangelo ’70,” a song by the late Nuevo Tango legend Astor Piazzolla. Carter’s bow beautifully rose and dipped as she made her violin sing. She is a true musical virtuoso, having taken up the violin at four years old. It was an impressive group rendition of this piece, with each of the talented musicians having a solo highlight at some point in the performance. After this, Ziegler’s “Desperate Dance” seemed to be a more repetitive, even jarring, composition. From that tune, the group moved into “Elegante Canyenguito,” the music flowing harmoniously back and forth as if the instruments were having beautiful conversations with each other. “Muchacha de Boedo” was a languorous, heart-felt piece, with both Carter’s violin and Del Curto’s bandoneon particularly shining. Ziegler announced that the last composition would be the Piazzolla tune “Chin Chin.” Ziegler’s quartet and Carter were sizzling as they wowed the audience with both their dexterity and interpretation. When the five musicians walked to the edge of the stage to take a bow, the audience jumped to their feet and applauded heartily. It was obvious how much the audience appreciated that these musicians work very passionately at their craft.